View of Call for Peace with Anna Halprin's Planetary Dance, Dohee Lee and Jahan Khalighi, performers, 57th International Art Exhibition, La Biennale di Venezia, 2017, Venice. Photo: Alessandro Illuzi. Through her long collaboration with her husband, the landscape architect Lawrence Halprin, Anna Halprin has fine-tuned the relationship between dance and the architecture of space. Her Planetary Dance exemplifies this, creating a moving mandala. She now brings this dance's transformative power to the 57th International Art Exhibition of La Biennale di Venezia. 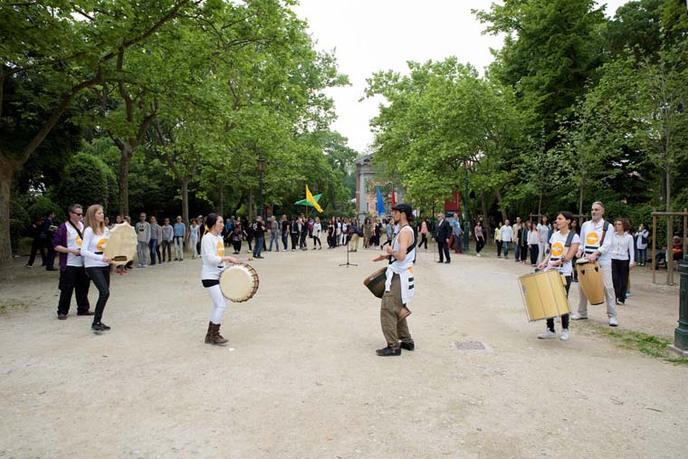 The exhibit includes video, photographs, and scores, plus a live public dance led by musician/poet Jahan Khalighi (her grandson) and celebrated performance artist Dohee Lee. 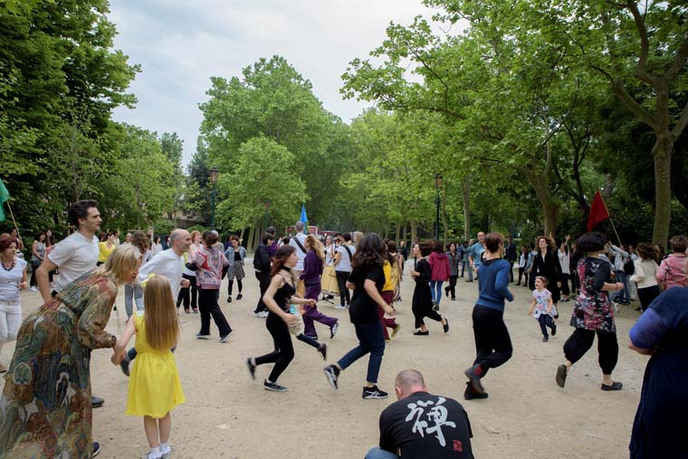 Open to people of all ages and abilities, the Planetary Dance is a call for peace among peoples and peace with the environment. Participants voice their personal commitment to peace and then run or walk to a steady beat in a series of concentric circles. When large numbers of people move together to a common pulse in a clearly designed pattern, an amazing force takes over, inspiring people to take action for change. 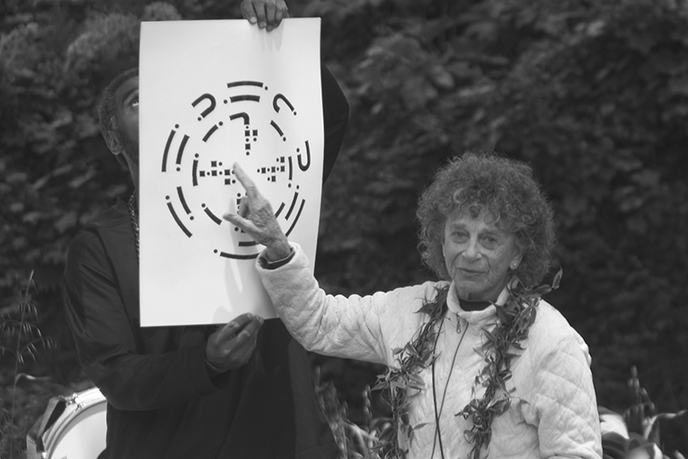 A leading dance innovator for more than seventy years, Anna Halprin has had an impact on all the arts. She influenced the Judson Dance Theater through students Trisha Brown, Yvonne Rainer, and Simone Forti. She also inspired Meredith Monk, Eiko and Komo, Terry Riley, Morton Subotnik, Chip Lord, Janine Antoni, and countless others. Halprin's approach integrates life and art. Her work addresses social issues like racism, helps build community, fosters healing, and connects people to nature. She established one of the first multiracial dance companies; created programs for cancer and AIDS patients; and helped pioneer expressive arts therapy, cofounding Tamalpa Institute with Daria Halprin. She and her husband, Lawrence Halprin, developed methods of generating group creativity. 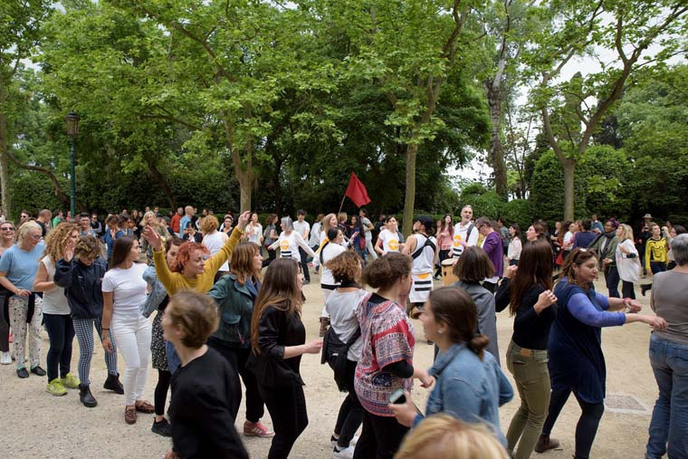 Her Planetary Dance, a community ritual promoting peace, has been performed worldwide for thirty-six years. Books and films like Breath Made Visible document Halprin's contribution, and her many honors include a 2014 Doris Duke Impact Award.